Power star Pawan Kalyan despite has taken divorce from his actress-wife Renu Desai, has never let his kids face that trauma. He has always been there for his kids, especially son Akira Nandan. 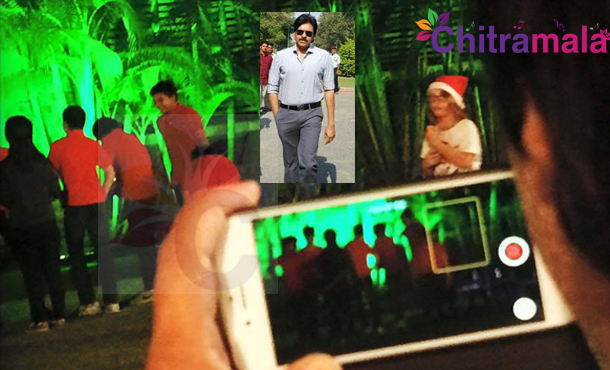 The other day Pawan has reportedly attended a school event of Akira when the kid gave a performance. Pawan even encourage him by taking the video in his cell phone, by sitting in the front row. Due to the coming Christmas, few events are being conducted in Akira’s school and as soon as Pawan learnt of this, he landed there to encourage his son morally. Renu Desai has revealed this news on twitter. Despite she is away from Pawan, she always keep posting news regarding Pawan‘s activities. Power star Pawan Kalyan is now busy with the shooting of his forthcoming film “Sardaar Gababr Singh”. The movie will hit the theaters in summer 2016.